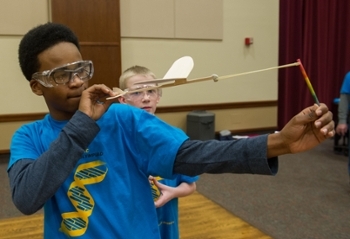 Southern Illinois University Edwardsville was abuzz on Saturday, Feb. 13, as more than 450 students from 21 area schools demonstrated their advanced science, technology, engineering and math (STEM) skills at the annual Science Olympiad regional tournament. This year’s tournament boasted one of the highest levels of participation in the region’s history. Participating students traveled from as far north as Mount Pulaski and south as Carbondale to compete in the day’s interactive, hands-on events. 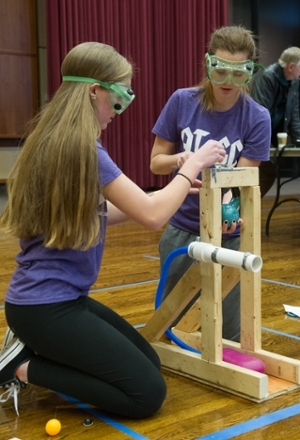 Participants have been preparing since October to compete in such events as the Air Trajectory, Disease Detectives, Bridge Building, Elastic Launch Glider and more. “I want to be an engineer so this gives me some experience in the field,” added Aiden’s partner, 8th grade student Cameron Jackson. Parents and coaches agreed this extra-curricular activity gives students an opportunity to expand their knowledge of STEM topics. SIUE’s event is one of nine regional competitions in the state. Leading teams from each regional tournament will advance to the State Tournament held at the University of Illinois at Urbana-Champaign on Saturday, April 16. Photos: Pontiac Junior High students Cameron Jackson (front) and Aiden Toohey participate in the Elastic Launch Glider event. Mascoutah High School students Kaitlyn Jennings (L) and Colleen Spehar (R) test their build in the Air Trajectory competition.